YOUR SEARCH IS OVER! This Incredible Mission Viejo Home Is Located On A Quiet Cul De Sac Street In The Desirable Tract Of New Castille. With Over $400,000 Invested Into Renovations, You Can Move Right In! Inside You Will Be Greeted By High Ceilings, Luxurious Hardwood Floors & One Of The Most Functional, Adored & Sought After Floor Plans Around! A True Entertainerâs Dream, The Gourmet Kitchen Boasts Custom Cabinetry With Soft Close Drawers, Beautiful Granite Countertops, A Built-In Sub Zero Fridge, Viking Stove & Double Oven, Island With Seating Space, Soaring Ceilings, Recessed Lighting, Under Cabinet Lighting & So Much More. Also Downstairs Is A Family Room With Fireplace, Living Room With Fireplace, Dining Room, Guest Bathroom & Laundry Room. Upstairs, You Will Find Two Spacious Guest Bedrooms, A Guest Bathroom & A Large Master Suite With A Master Bathroom Featuring Dual Vanity, Huge Soaking Tub & More. Step Out On Your Private To Enjoy Your Morning Coffee In Peaceful Paradise. The Backyard Is A Showstopper! 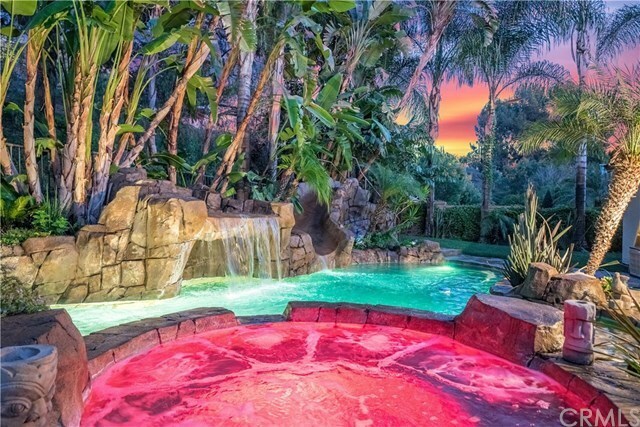 You Will Be The Talk Of The Town With Your Tropical Oasis Featuring A Custom Rock Pool Complete With An Oversized Jacuzzi, Grotto With Waterfall & Water Slide For Endless Fun. Spacious With Room For Patio Furniture, A Large Grassy Side Yard, & Rv/Boat Storage On The Opposite Side Yard, This Yard Is All You Could Ask For & More. Other Notable Features Of This Home Are A Tile Roof, Dual Pane Windows & Slider, Low HOA Dues, No Mello Roos, & Access To Lake Mission Viejo.